Engage and connect at Ponte Vineyard Inn in one of our refined meeting spaces designed to inspire. Enjoy over 8,000 sq. ft. of event space, built to maximize natural light and vineyard views to foster a creative environment. Let the ideas flow during the day with breakout sessions next to the vines and network in our underground cocktail bar, The Cellar Lounge. Build team relationships through local balloon rides, wine tasting or other group activities arranged by our staff. 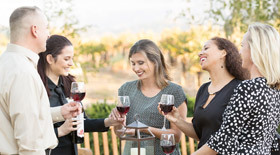 Leave the busy city life behind and host your next meeting or event in Temecula Wine Country. 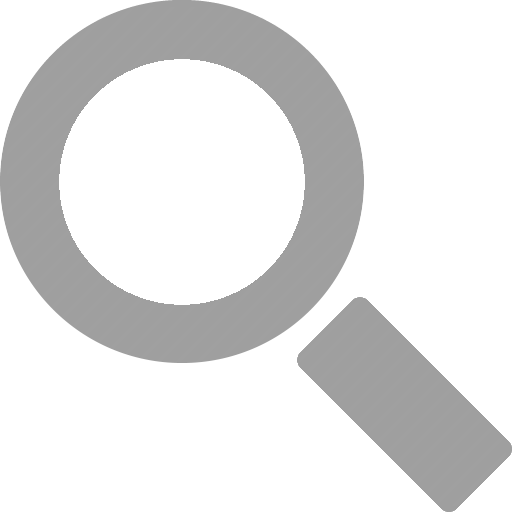 What is the cost for Wi-Fi/Internet Access in the meeting/event spaces? Wireless internet in the guest rooms and meeting/event spaces is complimentary. The Resort Fee is complimentary. With your stay, you will receive (1) Ponte Wine Tasting Ticket as well as in room amenities – (2) bottled waters, Keurig pod coffee and tea and safe. Yes, we do. We have cardio machines and free weights with complimentary access and vineyard views. Check in time is 4 p.m and checkout time is 12 p.m. Early check ins and late check outs are based on availability and not guaranteed. Guests occupying their room past 12 p.m. without prior approval will be charged accordingly. Ontario International Airport (60 Miles) and San Diego International Airport (67 Miles). We do have a local airport transportation referral to assist with all of your transportation requirements. Do you offer a shuttle for local transportation? We do not have a Ponte shuttle however we can assist you with contacting a local transportation company or taxi cab as well as transportation apps (i.e. Uber) does service our area. Ponte Vineyard Inn is located in the heart of Temecula Wine Country, just a short drive from Los Angeles, San Diego, Palm Springs and Orange County. 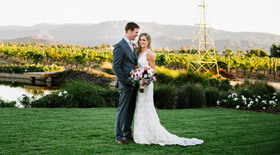 Ponte Vineyard Inn is steps from Ponte Winery, which offers wine tasting, wine tours, vineyard views, in room spa treatments, (2) Restaurants and the underground Cellar Lounge. Nearby activities include golf, day spas, hot air balloon rides, horseback riding through the vineyards, sky diving, historic Old Town Temecula and Pechanga Resort & Casino. Is there evening entertainment on property? The Cellar Lounge is the only full-service bar in Wine Country, this alluring and elegant underground lounge is located on the basement level of our Inn. Indulge in signature cocktails, craft beer, gourmet entrées, small plates and more! Live music is offered every Wednesday, Friday, Saturday and Sunday nights. Continue networking in the Cellar Lounge or by the outdoor fire pits for a productive end to the day. What do you offer for on-property team activities? A few on-property activities would be Wine Tasting, Vineyard Estate Tours, Tuscan Iron Chef Competition, Cheese and Wine Tasting Competition, Painting in the Vineyards. What are off-property team activities? Shuttled Wine Tasting Tours, Wine Tasting Tour by Horse Trolley, Horseback Riding through the Vineyards, Hot Air Balloon Rides, Sky Diving, Golf, Day Spa Experience, Brewery Tours just to name a few. Do you have a Green Program? Ponte’s commitment to sustainable practices is evident throughout the 300-acre property. From low-water succulent gardens to a naturally aerated pond to sustainably farmed vineyards, it is easy to see why conservation is one of our core values. Ponte Winery is proud to be named a Certified California Sustainable Winegrower, the first in Temecula Valley. Ponte Vineyard Inn was designed and built with sustainability in mind. Strategic placement on the property minimizes sun exposure to rooms, resulting in less energy use to cool. Guests are encouraged to turn off lights, and air conditioners shut off automatically when guests leave their rooms. Ponte Vineyard Inn is also a proud partner of “Clean the World,” a global recycling program for soaps, lotions and shampoos that sanitizes the products and gives them to children in need. Ponte Associates are trained and vested in the mission to leave a better planet for future generations. You all definitely took away the stress and made a girl feel like royalty! My Kaiser team loved everything! Thanks for making our offsite memorable! I will be definitely coming back again and telling others about you! We did a 3-day, 25-person business meeting at Ponte Vineyard Inn and they nailed the details. From the sleeping rooms to the meeting room, the guests were impressed. It was very easy to work with Samantha G and Crystal from a planning perspective. They made a great team and I felt like I was in good hands the whole time. Thank you, Ponte – we will be back! I was planning a group team building event and I knew Ponte would be the perfect choice. I am a proud Wine Club Member and every time I visit, everyone raves about the hotel. I have wanted to stay there forever and knew this would be the perfect choice to spoil my team. The hotel was gorgeous and the event in the Barrel Room was spectacular. I highly recommend Ponte for your next special event. Crystal and Samantha were spectacular and made this such a pleasure to plan. They paid attention to all the special details to make this night incredible. My team was all asking me if we could just come here every time! You know when you hear that, it was a big success. I can’t thank Ponte enough! You were marvelous and I appreciate your entire team and all they did. Can’t wait to come back again very soon! The place has an old world charm with modern amenities, very convenient but charming. I was there on a 2-night business meeting. The place was quite conducive for brainstorming. This place was indeed a pleasant surprise! The food was great – one of the best Cioppino I have tried. The restaurant setting overlooks the vineyard. First time visiting the property. The entire facility was fresh and inviting. The staff was extremely attentive and knowledgeable. Outstanding rooms. Wonderful food and wine. Meeting room was very comfortable. Hoping we will come back for another meeting soon. We really enjoyed staying at the Inn. The rooms are great and the property is beautiful and relaxing. The staff is unbelievably nice and very accommodating too. The meeting space was the nicest room we’ve ever found for our group and we’ve typically used hotels or casinos. We’ll definitely be back! Terrific grounds, well maintained and clean rooms and very friendly staff at Ponte Inn & Vineyard. I hosted a corporate meeting for 15 people and found the meetingroom, overnight room and hotel grounds and staff to be exceptional. Everyone loved it! Ponte Vineyard far exceeded my expectations. My room was great and perfectly clean, the staff were attentive and helpful (they knew me by name and room #), the food was very excellent, and the grounds are beautiful. I was here for business and the events/catering staff were phenomenal as well. They were always present for anything we needed. The meeting room was beautiful. I would definitely go back to Ponte with my family or for another corporate event! I was in Temecula with my friends and decided to do a few site visits for my business, too. We stayed at Ponte Vineyard Inn and were wowed with a spacious hotel room, great view, and wonderful service. The sit-down desk and wine at check-in give the feeling of luxury. Decor throughout hotel is upscale and classy. Perfect meeting space for meetings of 20-25, but they also have a larger space for weddings. I like that you have a feeling of a quiet oasis at the hotel but are just steps from the Tasting Room and nice lounge-style entertainment in the lower level Cellar Bar. Overall a fabulous experience – we would definitely stay again! Please complete the following information to assist in planning your wine country stay. We specialize in Corporate Retreats, Team Building Events, Incentive Trips and Executive Meetings.